I spotted a dozen wasps on a bunch on the lawn. During observation, a hornet has overflight us, and wasps escaped away, revealing a bat carcass. 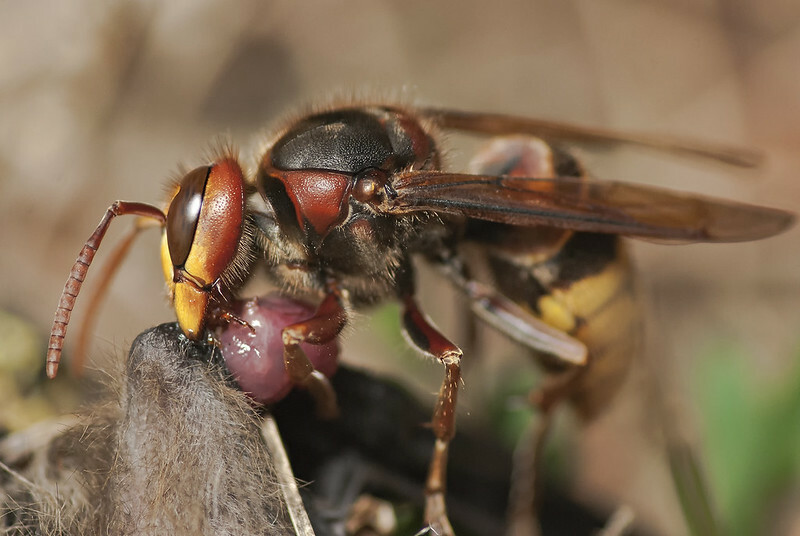 Hornet (Vespa crabro) landed near, nervously made three circles around the carcass, and start to bite off a piece of meat. Everything lasted for about 20 seconds, before he gone with 3mm wide piece of flesh. I succeed to take a few shots. This one is the most successful, but still a part of the legs was left outside the frame. I like the selective focus and detail — sharp where it needs to be. Nice detail at the head and thorax, fine flash lighting as well. Impressive capture- this really tells the story, and is well focused where it needs to be. Excellent!